Petit déjeuner (breakfast) is my favorite meal. My usual, small, yet simple breakfast consists of a small bowl of oatmeal or yogurt and coffee. If I have an extra few minutes to spare in my busy mornings, I might grab a good croissant and chocolat chaud (hot chocolate). Once in a while we will treat ourselves to a bit of luxury. Why not? We work really hard and deserve a petit déjeuner fabuleux every now and then, especially if it's petit déjeuner at Ladurée. I have dined at Ladurée in the past. 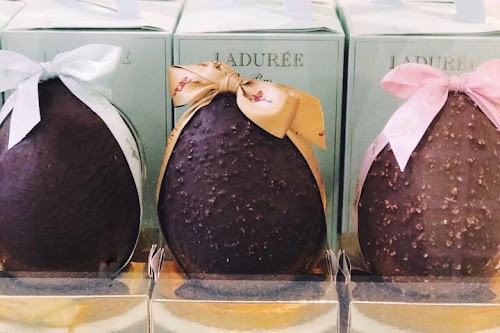 Yes, we frequent Ladurée in Paris for their famous macarons and pastries, but my husband, who has heard me praise their breakfast, has never eaten there before. When the opportunity presented itself, he couldn't say no. So we ventured to the newest location in LA at the Grove. We dined en terrasse, which we prefer to do whenever we are in town in Paris. Our meal consisted of Toast Brioché, Ecrasé d'Avocat et Œuf Poché (Toasted brioche, crushed avocado, poached egg and pumpkin seed), 3 mini rose croissants, Le Pain Perdu à la Rose (French toast served with raspberry coulis, rose whipped cream and fresh raspberries) and chocolat chaud Ladurée. Our meal was absolutely delightful as you'd expect at Ladurée. Every bite was pure bliss. The scent of rosewater as we ate our way through the rose croissants and the french toast was remarkable. Is your mouthwatering yet?